On the Saturday of Homecoming Weekend (10/21/17), the Knights took on Marvelwood School. Both teams played very hard and did not give up. The end score was 6-0 with many shots on goal for each side. The NYMA Player of the Game was Nigel Petti-Fernandez. Fellow cadets Remy Sykes and Kris Wu also had good games. 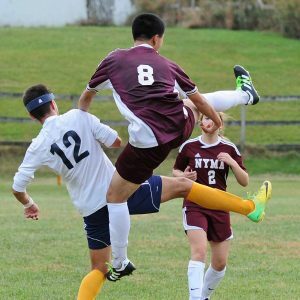 Monday, October 23rd, NYMA faced off against Storm King School. The Knights held them off very well and kept the score 1-0 through the entire first half. However, things started to fall apart on defense throughout the second half. Unfortunately, towards the end of the competition both teams got heated and had a small altercation. That aside, both teams finished strong and played with passion. The end score was 6-0 Storm King with highlights coming from Nigel Petti-Fernandez, Remy Sykes, and Jamal Pauletta. On Wednesday, October 25th, NYMA traveled to Poughkeepsie Day School for an intense match. Everyone played well on both sides and the two goalies had numerous great saves. P.D.S. won 9-0. The NYMA Player of the Game was Cadet Qin for his outstanding efforts on both offense and defense.